Just about everyone loves the idea of having a stylish bedroom, but this is perhaps particularly important to teenagers and 20-somethings. At the younger end of the age scale a bedroom isn?t just for sleep. Tween rooms and teenager?s bedrooms are a place where a large proportion of time is spent just hanging out and seeing friends – either in real life or video chat – and studying (hopefully). Similar can be said about the student demographic of 20-somethings, and even some 30-somethings nowadays! So, this collection of cool bedrooms covers a lot of ground to suit and satisfy the requirements and well-honed tastes of the up-and-comers, in a world that is more style conscious than ever before. Raise the stakes. A raised floor has been built into one side of this bedroom design, with a niche incorporated into it to accommodate a mattress. The lowered mattress makes the bed appear like a simple blanket on the floor at first glance. 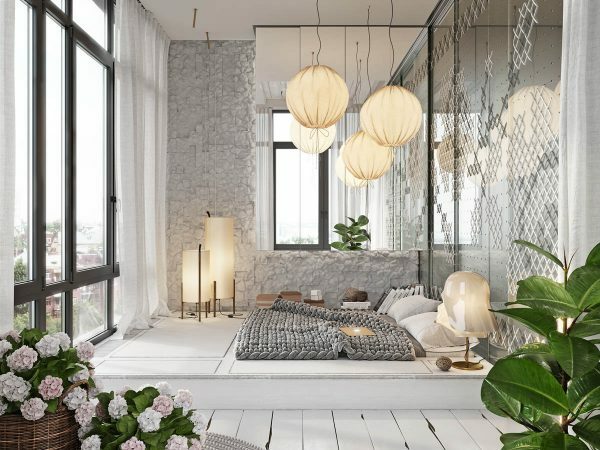 A trio of bedroom pendant lights float above the platform, like a sky of hot air balloons, whilst a selection of unique floor lamps light the side and foot of the bed.